ZiPS released: Who do they like? Who do they not? Cody Bellinger - ZiPS looks at Cody's '17 numbers and says "Okay that was good, but how about stealing some more bases, too?" I think this is a little bold, and if anything, I'm more worried about Bellinger falling short of the consensus projections. I'll stick with the combo projection, that still makes him solidly a top-20 to 25 player. Todd Frazier - We shouldn't expect Frazier to be anything more than a .230 hitter at this point, after posting .225 and .213 figures the past two years. His BABIP has rightly plummeted as he's become more of a flyball hitter who pops up a ton. I do like ZiPS thinking on the speed - I could see Frazier starting to run a bit more as he plays for a Mets team that is trying to stretch out every bit of value they can get this year. There are also talks of him leading off. Gleyber Torres - This one is interesting, as ZiPS sees Gleyber tapping into his HR swing more than the other systems. Minor league track record might back this up (7 HR in 235 PA in '17) when we consider that the MLB HR-rate is higher than MiLB these days by a significant margin. Biggest question for Gleyber might be when he gets promoted, so keep an eye on him in spring. Dylan Bundy - I've already discussed him elsewhere in these posts, his projections are all over the place. ZiPS/ATC both like him, Steamer hates him. In this case I might listen more to the advice of the wise minds over at FanGraphs/BP/PitcherList this preseason and see what they think of Bundy. Cole Hamels - Personally, I'm staying far away from Hamels. ZiPS sees a bit of a bounceback despite the complete collapse in K-BB% over the past two seasons. I don't get it. Trea Turner - ZiPS sees his K% jumping significantly, and the Runs are way low for a guy expected to leadoff for the Nats. Can't say I buy either take there. Nelson Cruz - I hashed this out a bit with someone in the /r/fantasybaseball thread about ZiPS the other day, I think ZiPS must just be applying a more aggressive aging curve to Cruz. It's not unfair - there's always a chance for a big collapse looming for an old, slow slugger like this. Manny Machado - Another one that has showed up elsewhere in these posts, it seems your projection on Machado depends heavily upon how much you weight a down-year in BABIP for him in '17. Manny is an easy call to bounce back, I'll stick with the consensus here. Francisco Lindor - Do we buy the big power breakout last year? ZiPS doesn't buy it as much as everyone else. It's not unfair, but early pics of Mr. Smile in spring camp have him looking YOKED. Don't be surprised by a repeat of the 30 HR from last year, as long as the juiced ball is here to stay. Chris Sale - I included this one just because it's so perplexing. Sale struck out 300+ guys last year! ZiPS sees his K rate dropping way, way down. I don't get it. What does everyone think? 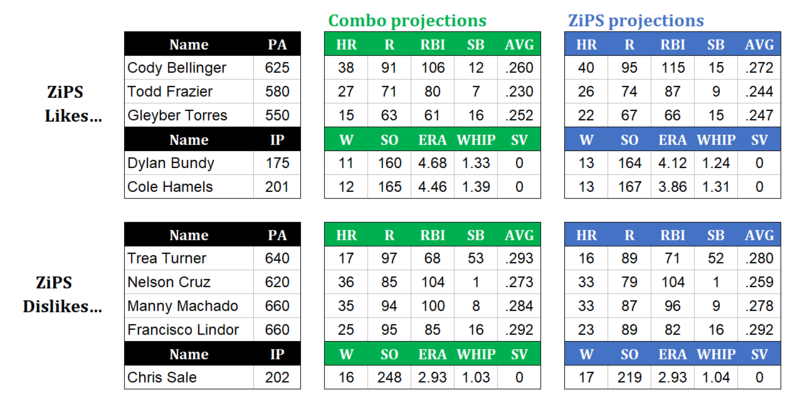 Is ZiPS more right on these players, or do you prefer the consensus projections? Are these players you want or players you're avoiding?